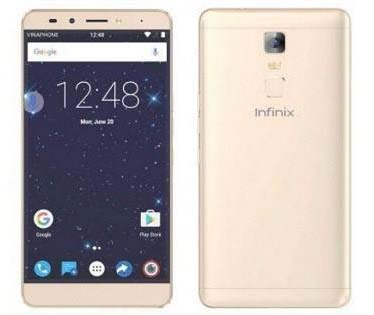 Infinix launches one more exceptional Smartphone with the name of Infinix Note 3. It is an amazing cellular phone has introduced by Infinix along with exceptional features. It is providing Android Marshmallow upgraded system to easily usage for Android users and it is upgraded version so users don’t get to face hanging issue by using this Smartphone. It is providing dual SIM option for using two SIMS connections in a single time so this is really reliable for all those cellular operators who mostly travel in many Countries so they can easily connect two SIMs in this mobile phone for using. This hand-set also gives 2GB RAM option with 16 GB built-in memory feature and this is not enough because it is also providing micro-SD external storage facility up to 128GB along with dedicated slot. The camera facility is also phenomenal of this Smartphone and it provides high quality camera option in this cellular phone. Buyers get 13 mega pixels rear and 5 mega pixels front camera option for taking countless photos or recording videos. Infinix cares of its valued customers and it always brings Smartphones with mind-blowing incentives. This is perfect and complete package Smartphone for Smartphone’s users and they can easily enjoy all telecommunication facilities through this hand-set with speedy service. The complete specification details of this mobile phone are mentioned as below. Processor:Octa-core 1.3 GHz and Mediatek MT6573 chipset. Rear Camera: 13.0 mega pixels (Face beauty feature). Display Pixels: 1920 × 1080 pixels. Display Colors:FHD IPS Display and Crystal Display Feature. Bluetooth v4.1, A2DP, Micro USB v2.0, Wi-Fi, Wi-Fi Hotspot, GPRS, EDGE, WLAN, LE and EDR. Audio: FM-Radio, 3.5mm audio jack, MP3, MP4, WMA Player, FLAC Player and Other multi-media players. Ringtones: MP3, Polyphonic ringtones, WAV Files, Downloadable and Sound-recorded. Other Features: GPS Support, A-GPS Support, Dual-standby, HDR Camera option, Document viewer, Photo/Video editor, Speaker phone, Calendar and Google search. Latest Features: X-Charge 3.0 Battery, Accelerometer sensor, Micro-SIM, GLONASS supported, Multi-touch option, External micro SD supported up to 128GB and Proximity sensor. Available Colors: Crystal gray, Golden, Champagne Gold and Silver.